Rotherham Hospital inpatient pain team lead Ruth Roddison introduced the use of Acupins – small pins protruding from a fabric backing – to reduce post-operative nausea and vomiting (PONV) in patients undergoing hip or knee surgery or hysterectomy at the hospital. As well as improving the patient experience, the technique has reduced the need for medication, shortened length of stay and prevented admissions at the hospital, part of the Rotherham NHS Foundation Trust in South Yorkshire. Despite many years’ experience in helping to reduce PONV in two high-risk groups – patients having a hysterectomy or a hip or knee replacement – 30% of those having a hysterectomy and 48% of patients undergoing a hip or knee replacement were still suffering nausea and vomiting, says Ms Roddison. After completing an acupuncture course, she decided to explore the use of the Acupin as an anti-emetic in the two groups. ‘There is an evidence base,’ she says. ‘A 2015 Cochrane Review found that acupuncture for PONV is as effective as a single anti-emetic agent. 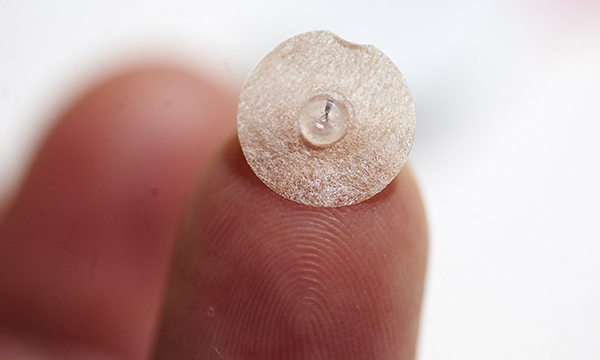 After convincing medical and nursing colleagues across the relevant specialties – gynaecology, orthopaedics, anaesthetics, theatres and pain teams – that it would benefit patients and the trust, Ms Roddison obtained permission to purchase some Acupins, which when inserted look like a tiny plaster. 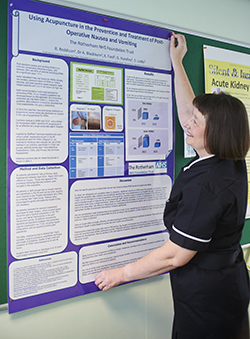 She developed a standard operating procedure, evaluation form and patient information sheet, then produced posters and delivered lectures to engage staff before training pain nurses to site the pins. To find the best position for the pin, the patient places three fingers at the crease of their wrist; the centre of the arm above that point is the location for the pin. They are asked to press their thumb and little finger together to make the tendons visible. The area is then cleaned and the Acupin is gently inserted between the tendons. The patient may notice a slight sting, but usually feels nothing. ‘I held small workshops to ensure all nursing staff were aware of the project, that the site was inspected on a regular basis, and that Acupins were removed prior to discharge, which is the ward nurses’ role,’ says Ms Roddison. Wards were informed of the patient’s name, where the Acupin was sited, and when it must be removed. Evaluation forms were completed daily by the pain team. One of Ms Roddison’s biggest challenges was persuading some of her colleagues about the technique. ‘It took some work getting them to accept this “hocus-pocus” approach,’ she says. ‘But I have been in post for many years and am well-known to them all. Armed with the evidence and my enthusiastic approach, they agreed to the project. The surgeons weren’t the only ones who were unsure about the technique. Charge nurse Lee White, who managed the orthopaedic wards on which the Acupin was trialled, also had reservations at first. ‘But I have seen patients have a better post-op nausea and vomiting experience when they are used,’ he says. ‘Patients are able to mobilise quicker, so they can be discharged faster. ‘I would definitely recommend the Acupins to nurses in other trusts,’ he says. Now matron for orthopaedics and rheumatology, Mr White supported consultant rheumatologist Fiona Fawthrop in introducing the pins for patients starting on methotrexate – a drug used to treat rheumatoid arthritis – who are often sick for the first few days. For Ms Roddison, securing funding was also a challenge. ‘I convinced the business manager to fund the project by proposing that it would potentially result in a cost saving. At the very least, it would be cost neutral,’ she says. The Acupin trial covered 80 patients. Half were undergoing open total abdominal hysterectomy and the rest were having hip or knee replacement surgery. Evaluation of the project showed a dramatic reduction in PONV. In the hysterectomy group it reduced from 30% to 7%, and in the joint replacement group it fell from 48% to 18%. When nurses on the day surgery unit heard the feedback, they asked to be trained to insert the pins for their patients. Now the nurses offer the pins to all patients undergoing inpatient and day surgery. Other specialties also saw the initiative’s significant potential. Gynaecology nurses, led by ward manager Karen Charlesworth, asked for training to use them for women with hyperemesis in pregnancy. The outcomes were so impressive that the hospital and community midwives asked to be trained. For the past six months, Acupins have been used for children having appendectomy. ‘These are currently being inserted by the pain team nurses, but we are working towards training the paediatric nurses to offer and insert them for all children at risk of PONV,’ says Ms Roddison. Training for palliative care nurses is complete, with training for the chemotherapy team due to begin shortly. Ms Roddison’s training programme has included ward and department level drop-in workshops in the hospital and community, lunchtime sessions for midwives in clinic, and one-to-one sessions on request. It is now included in mandatory training and at anaesthetists’ inductions, and colleagues in the community have also noticed the impressive results. ‘Our GPs and community pharmacy colleagues have become very interested in our Acupin work,’ says Ms Roddison. ‘Last summer I went to a local practice and trained all the GPs and nurses to insert the Acupins, and they are currently auditing their use. ‘They plan to use them for hyperemesis, nausea and vomiting in pregnancy and also travel sickness,’ she says. The project’s success has seen it evolve further, with permission recently granted by the hospital patient safety committee to teach pregnant women to insert their own Acupins. This will also apply to rheumatology and chemotherapy patients. Ms Roddison and her team were shortlisted in the Innovation in your Specialty category of the RCNi Nurse Awards 2017, and at the trust’s own annual awards ceremony Ms Roddison won an Excellence in Healthcare award, partly for the impact of the project. But she is most proud of how it has improved patient experience. ‘PONV can be very debilitating,’ she says. ‘For women with severe nausea and vomiting in pregnancy, some feel we have given them their life back. One said the Acupin was wonderful because she stopped being sick after just 24 hours, and after two days the symptoms went away completely. Jess Salvin is lead nurse for the palliative care team at Rotherham NHS Foundation Trust. She and her team were trained by Ruth Roddison to insert Acupins in patients with nausea and vomiting. Jess Salvin with a patient. ‘I had been struggling with severe nausea and vomiting myself during the first trimester of my first pregnancy,’ says Ms Salvin. ‘I had been prescribed Cyclizine but it made me drowsy and I could not take it due to work. ‘I developed a urinary tract infection and constipation secondary to the vomiting. Ondansetron, which is prescribed for morning sickness, was not deemed a good option as it can add to constipation. ‘My doctor and midwife had been reluctant to prescribe further anti emetics as they felt it was hormone-related. I also have atrial septal defect, and suffered a transient ischaemic attack aged 24 in relation to this, so they wanted cardiac opinion prior to prescribing anything further,’ she says. ‘I felt quite let down and alone with my nausea and vomiting, as if it was expected I would just get on with it. By the time I reached 14 weeks with no easing in symptoms I was keen to try the Acupin. But I had been quite sceptical about acupuncture and alternative therapies so was not holding out much hope it would work. ‘I found Ruth’s teaching of inserting the Acupin quick and easy to follow and it gave me something I could take control of. ‘I still have on-off vomits but I don’t have much nausea at all. After feeling brave enough to take out the pin the other day – thinking that at 20 weeks the nausea would have gone – I spent last night feeling terrible. I was nauseous and vomited throughout the evening. I have now replaced the pin and my symptoms are easing. ‘Nausea and vomiting took over my life. Psychologically, I associated vomiting with certain foods, and became panicky about eating out or in and not making it to the toilet in time. It ruined the first 14 weeks of pregnancy. The search for the best in nursing is under way, with entries open for the RCNi Nurse Awards 2018, the profession’s top accolade. The awards offer a chance to nominate a colleague or team for their outstanding contribution to care, or share excellent practice with the wider nursing community. Winning can raise the profile of a specialty or the challenges faced by a particular patient group.